I travel to China every morning without any flight delays, lost baggage or jet lag. And I get paid to do it by working for VIPKID from the comfort of my own home. As a teacher with VIPKID, I can make my own schedule, I have very little prep work and I make between $18 and $22 per hour. VIPKID is a company headquartered in Beijing, China, that provides a one-on-one, interactive English learning experience by pairing American ESL instructors with Chinese children. VIPKID is exploding in China: There are about 10,000 teachers and hundreds of thousands of students. They were recently voted number 5 on Forbes Top 100 Companies Offering Remote Jobs List. As the company grows, they are hiring more teachers, but also raising the bar. VIPKID requires applicants to have a bachelor’s degree and you must be eligible to work in the U.S. and Canada, but you can be located anywhere. If you’re a certified teacher in the U.S. or have ESL experience, you have a good chance to move forward to the interview. 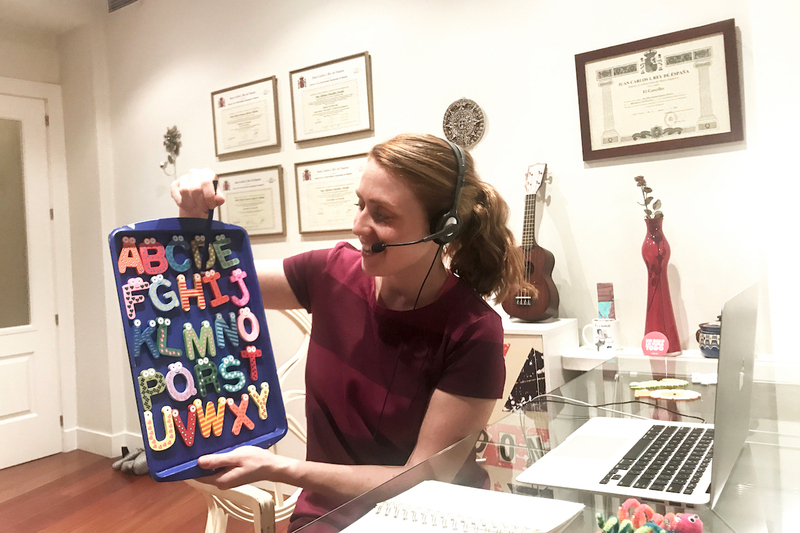 In order to teach, you’ll need headphones with an attached microphone and some props (toy letters and DIY finger puppets are my favorite). A good computer with a camera and a stable internet connection are obligatory. The very first step to working for VIPKID is to fill out the short online application. I am not a certified teacher in the U.S., but I have taught ESL for the past three years in Spain. I am very bubbly and creative and I can relate to what it’s like learning a new language — it ain’t easy, at least not for me. My interview was approximately 30 minutes over VIPKID’s own video conference software. I answered some questions and did a 10-minute demo lesson. For my simple demo lesson, I taught a few vocabulary words and the letter ‘P’ sound. The teacher instructions are on the bottom of each slide, even in the actual classes, so you’ll always have an idea of what you need to do. After I passed the interview, I spent a few hours learning about VIPKID though a variety of materials provided. To ensure I did my homework, I had to take a quiz on the material presented — hold the sweats: this one wasn’t that bad. Next, I was given a lesson plan and a few days to prepare for the upcoming 25-minute mock class. This is a demo lesson with a fellow VIPKID teacher acting as if they were a student between the ages of 4 and 12. It’s a little odd at first, but I quickly got used to it. It’s very important to take into account your timing. I didn’t finish the whole lesson because I was already over 25 minutes, but I think this comes with practice as you get used to the classes. From start to finish, the mock class process took about 10 days. If you’ve ever tried learning a different language, you know how difficult it could be if the person you are speaking to is not aware of how fast they are speaking. Therefore, your speed of speech and enunciation are imperative to a successful mock class and your student’s success. Just like Goldilocks, you don’t want to speak too slow, or too fast, but just right. Make sure you pronounce each syllable and be careful of your word selection. Basic language is key! It’s important to bring a lot of energy and use “TPR,” or Total Physical Response. This means using gestures to help the student to understand, like cupping your hands around your ears or pointing to your mouth when prompting the student to repeat. If you want to be part of VIPKID, you have to give it your all. In mock classes, you will look completely silly wearing giant glasses and using puppets while talking to an adult as though they were 5, but this is what VIPKID wants to see — and it’s how you’ll snag the job. There are tons of videos on YouTube of current teachers giving advice for a successful mock class, which were all very helpful. After logging into VIPKIDs video classroom, I spoke with the teacher for a bit and then jumped right in. I did half of the lesson, received some feedback, finished the lesson and then we discussed what went well and what didn’t. The base pay per 25-minute class is between $7 and $9. The pay range here is contingent upon your experience and qualifications. For each class, you’ll get an incentive between $1.50 and $2. You can earn an extra $1 for finishing the class, plus an extra $1 for completing 45 classes per month — or 50 cents for completing 30 classes per month. It’s quite easy to complete 45 classes within the month so you can add on an extra $2 to your base pay per class. As an earnings example, let’s say your base pay is $8 per class and you qualify for the extra $2 in incentives for a total of $10 per class. At a typical rate of two classes per hour, this would bring your pay up to $20 per hour. I would highly recommend applying to VIPKID toward the end of the month so you can officially start in the beginning of the following month. This way you’ll have a whole month to work up to the 45 classes, since it takes a little while to fill your schedule. Remember that since you are an independent contractor, VIPKID does not take taxes out of your paycheck. It will be your responsibility to put aside a portion of that money for when Uncle Sam comes knocking. The objective of a trial class is to make the student love the class experience enough to join VIPKID. The $5 bonus for every student that joins VIPKID is your incentive for being so bubbly in the morning. In my first two weeks, I converted eight children into VIPKIDs and gained most of my regulars that I see every week. In my first couple of weeks, VIPKID filled my schedule with trial classes. I filled out my VIPKID application in the beginning of February and by mid month I had my first trial class. Since it takes a little while to pick up, in my first week I had only completed eight trial classes. From those, three of them became my regular students, whom I still teach today. In my second week, I taught 27 classes, and then squeezed in 10 more within two days to qualify for the extra $1 incentive. The hours you work are totally up to you, but VIPKID suggests opening your availability during peak times such as weekends during 6 p.m. to 10 p.m. Beijing time, which is 6 a.m. to 10 a.m. EST. We’re working with children who are in school for most of the day; most of them are only going to be available after school and on weekends. It takes a little getting used to, but eventually you’ll start looking at the clock and automatically thinking about what time it is in China. I’m currently living in Madrid, Spain, and I work from 12 p.m. to 4 p.m. when my schedule permits. I also open up weekend classes on short notice if I’m not busy. I work for VIPKID on the side while teaching ESL in person, learning Spanish and working on a few professional endeavors. When I am back in New York for the summer, I can dedicate more hours to VIPKID. Aside from the basics, what I love most about this job is the experience. It may be my love of foreign cultures and people from all over the world, but working for VIPKID is more than just a job — it’s an international experience. Loni Slatkin (@mindsetrainer) is an international ESL instructor and Certified Professional Mindset Coach. She is currently leading a double life, living between New York and Madrid, Spain. It’s a good thing she likes airplanes.